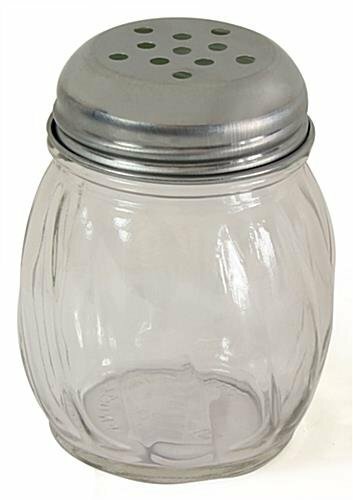 These rust-resistant steel-top containers, cheese shakers with perforated lids are a pizza parlor essential! Use these red pepper cruet holders in your restaurant or on your buffet. These small glass cheese shakers, also known as seasoning dispensers, are great for the tabletop or at a service station. The stainless steel lids are made of food-grade metal that is resistant to rust. These are great cheese shakers that are for pizza shops because they hold seasonings like oregano and crushed red pepper flakes. Overall Width x Height x Depth 2.6" x 3.5" x 2.6"Shipping to Canada and Mexico: import duty and fees apply.